“The dreamer whose dreams are non-utilitarian has no place in this world. Whatever does not lend itself to being bought and sold, whether in the realm of things, ideas, principles, dreams or hopes, is debarred. In this world the poet is anathema, the thinker a fool, the artist an escapist, the man of vision a criminal”. 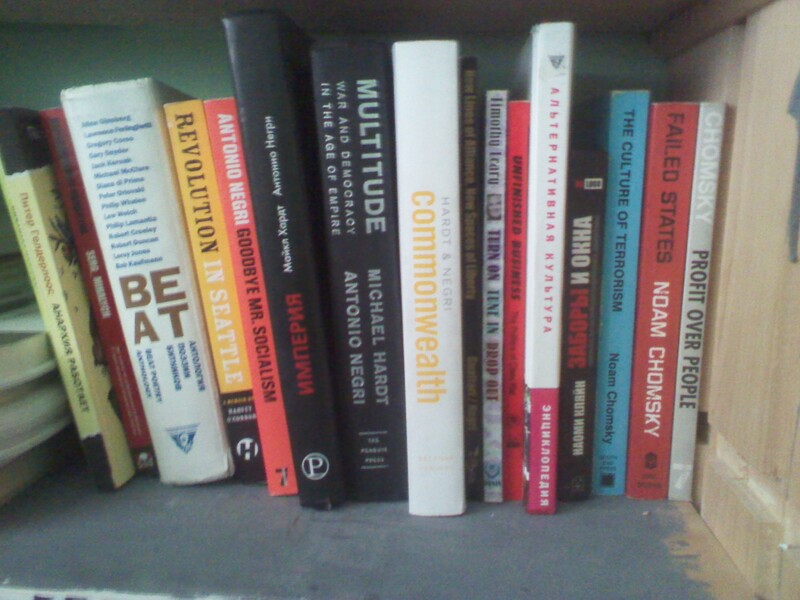 Rebel Studies Library is a new alternative non-commercial volunteer-based anti-authoritan diy library, working in the belarussian cultural zone (founded 05.12.2011). We provide free and open, non-commercial public space for reading books (in english, russian, ukrainian, belarussian, german, polish, spanish, italian, arabic languages), watching movies and discussions. You don’t pay money for using books and watching movies. Right now, we have about 1700 books of relevant to the contemporary world literature (Fiction, Cinema, Cultural Studies, Theatre, Religion, Philosophy, Psychology, “Radical” books, Zines, Magazines, Pamphlets etc.). We have books from the following radical publishing houses: City Lights Books, AK Press, Freedom Press, Autonomedia, South End Press, CrimethInc., Verso, Pluto Press, Feral House, Loompanics Unlimited, Black Powder Press, Eberhardt Press etc. We don’t charge money for borrowing books, but we have one rule – not more than two weeks. (+13.01.2012) You can also extend using a book. In this case, you should notify library telling the exact date when you will return a book. If you don’t return book during this time, you don’t have permission to use library anymore. We’re based in the Minsk, Belarus. Hallo, I see you have a copy of Anarchy in a Cold War in your library. I would be happy to send you another copy but for that I need your postal address.